The Liebers: #TuesdayTen: Back To School Time! 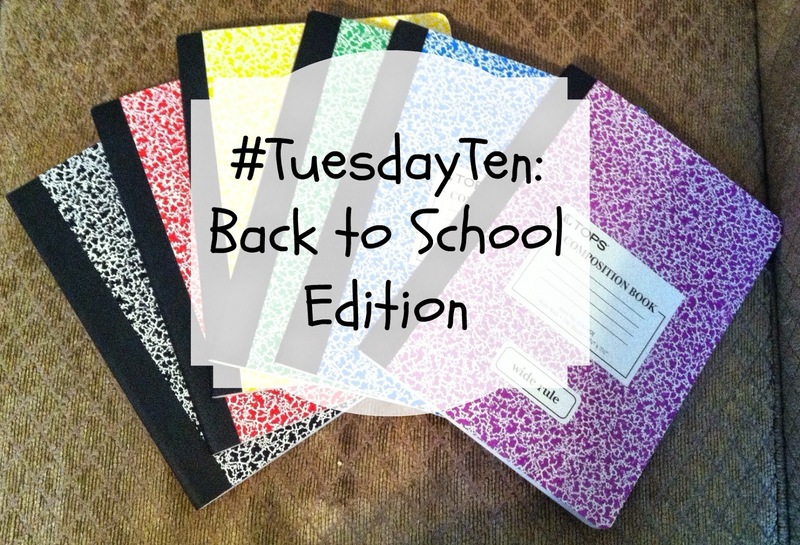 #TuesdayTen: Back To School Time! It's Tuesday and I'm late for my own linkup!! How appropriate that we are dishing back to school pros and cons today!! I'll bet you can guess a couple of things on my list already! 2. Routines--Boo! On the other hand, there is a bit of monotony involved in a regular schedule of wake up, get ready, go. In the summer it's easier to take a day off and just do nothing. During the school year I can't just pull the kids out of school to play hooky for something fun. 3. Learning--Yeah! My kids love learning and I love seeing what new things they've discovered. I told Frances this morning that her math homework looked kind of hard. She shrugged and said, "It's just exponents and square numbers!" My girl loves math and I love that about her! 4. Homework--Boo! I know it is a necessary evil, but getting homework done is like pulling teeth at my house (and houses everywhere, apparently!) Thankfully, they usually get it done at their after school program, but I still have to go through their backpacks, sneak papers into the trash and sign forms every night. That's hard work too! 5. Activities--Yeah! We're getting ready to get back into the swing of things with ballet, soccer, and violin. I'm even thinking of getting the older two into the children's choir at church...because I'm crazy! They love all these activities and I love watching them shine. Plus, Benjamin gets to play soccer this year and we just bought him the cutest, tiniest, day-glo yellow cleats! 6. Activities--Boo! On the other hand, activities mean running around all over town in the evenings, coordinating schedules with Ken, dinner on the go and fewer family nights at home. Plus, Saturday morning games for two this year. 8. Sleeping in on the weekends...just kidding! That never happens! 9. New friends for the kids--Frances is at a new school with about two and a half times the number of classmates. She's making new friends and meeting new people. That's exciting for her. Henry has a few familiar faces in his class, but he also gets to meet new people. And Benjamin is BACK IN CLASS WITH SIMON!! He and his best friend got separated in April of last year and now they are back together. It's been a major topic of conversation in our house for a few weeks. 10. New friends for me--I've got new parents to meet from school, new students to get to know at work and new kids to meet in Sunday school classes. Meeting new people is fun, and who knows? I might find a real gem! How about you? Are you jumping for joy as soon as the bus leaves or holding back tears in the drop off line?